Home » How much does quality education per student cost in public schools in Brazil? 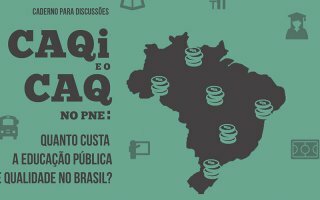 Under the theme “How much is quality public education in Brazil” the Brazilian Campaign for the Right to Education hosted an event to launch the Brazilian Edition of 2018 Global Action Week earlier in June this year. The occasion presented delegates the opportunity to reflect on the current status of national education policies and deliberate on next steps to ensure quality public education for all Brazilians. To measure the cost of quality public education in Brazil, The National Campaign for the Right to Education has created a mechanism to translate into values, just how much the country needs to invest per student per year. The Cost of Initial Quality Education per Student (CAQi) and Cost of Quality Education per Student (CAQ) is a strategy implemented by NEP to bring CAQi and its methodology closer to Brazilian citizens. To calculate CAQi, several factors that influence a students’ learning are considered and foreseen in the Brazilian legislation. “The calculation takes into account the minimum conditions a school must ensure, regardless of where it is” says José Marcelino de Rezende Pinto, a professor at the Faculty of Philosophy Sciences and Letters of the University of São Paulo (USP) in Ribeirão Preto and a key contributor to the construction of CAQi / CAQ. Conditions such as size of classes, equipment and adequate infrastructure, teaching materials and spaces such as libraries are included in the account. In addition, non-material factors include teacher training and salary comparison with other higher-level careers and specialized professionals. The idea of stipulating this cost and making it viable is not new. The discussion began in the 1970s, and the Federal Constitution in 1988 and the National Education Guidelines Act (LDB) already provided the minimum quality standard for Basic Education. The mechanism for calculating this indicator, however, was developed in 2007 by the Brazilian Campaign for the Right to Education. According to the National Education Plan, the CAQi – which is the minimum (initial) rate that should be invested into quality education – should have been implemented by June 2016. However, the proposal never went out of print. “The NEP has been scorned not only by the lack of prioritization of the right to education, but also by a policy that imposes a spending ceiling until 2036,” says Andressa Pellanda, education policy coordinator of the Brazilian Campaign for Right to Education. “The first version of the CAQi was approved by the National Education Council in 2010, but the government did not ratify it”, recalls Professor Marcelino. In 2016, an attempt was made to resume the implementation work with the Inter-Institutional Commission for Implementation of the CAQ and CAQi. The committee’s proposal was to analyze the implementation paths, but was revoked in 2018 to give place to the Standing Committee for the Evaluation of Costs of Basic Education. This Committee excluded from its composition both the Brazilian Campaign for the Right to Education and the National Confederation of Education Workers (CNTE), which were included in the first group. But what is the CAQ? In addition to the CAQi proposal, the National Education Plan also brings a second indicator, the Cost of Quality Education per Student (CAQ). This would be a step following the CAQi implementation. “The CAQi is the minimum starting point for ensuring quality education. But these conditions are not enough” says Andressa. “The CAQ proposes a progressive effort to reach a level of quality more similar to that of other developed countries in terms of education.” Thus, once implemented, the CAQi would be progressively readjusted until it reaches the value of the CAQ. The deadline for defining this second indicator, by NEP, expired in 2017. However, the Ministry of Education (MEC) did not develop a proposal for the CAQ. This proposal started with the Campaign in its new publication. “The proposal to implement a Cost of Quality Education per Student is a breakthrough” stated the education policy coordinator of the Brazilian Campaign for Right to Education. “If Brazil historically plans spending on education from the budget, the proposal reverses this logic. Instead of starting from what is supposedly available in the budget, it comes out of quality inputs to calculate how much we need to ensure quality public education” Andressa says. However, with the delays in complying with the NEP and without an official commission dedicated to the subject, the Cost of Quality Education per Student continues without a forecast to be implemented. “Today, we invest three to five times less in basic education than the minimum foreseen by the CAQi / CAQ mechanism. In other words, we fall far short of the dignity of offering the right to education in Brazil and, therefore, we need to move forward in implementation of the law” concludes Andressa. BCRE already carries out several international cooperation projects – especially in Latin American and Lusophone countries – on education financing and the CAQi / CAQ. Their proposal for the next steps is to translate these materials in order to expand this work and collaborate to ensure quality public education in other countries. *Originally published in the website of the Brazilian Campaign for the Right to Education.